It’s not a proper brunch without quiche on the menu! 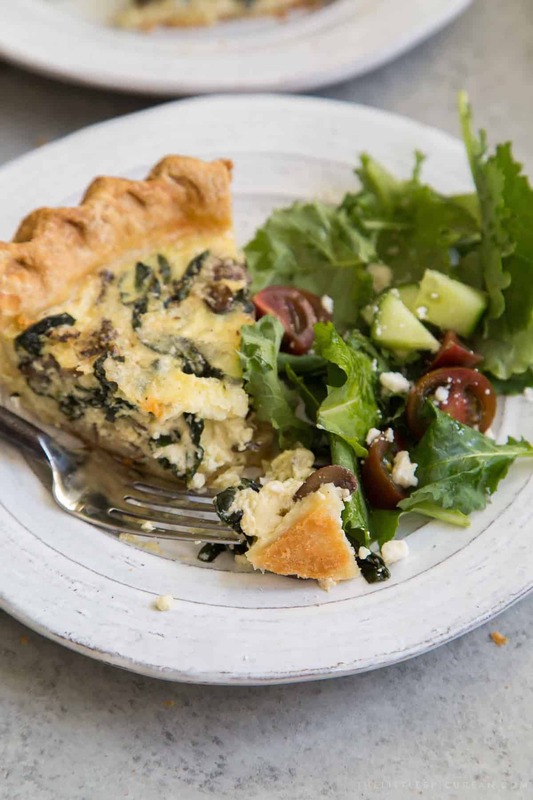 This mushroom kale quiche is loaded with shredded Monterey Jack cheese and is baked in a homemade buttery, flakey pie shell. There are certain breakfast and brunch menu items I refuse to order at restaurants and cafes. These include avocado toast, baked eggs, and quiche. I prefer to make these at home because I’m quite particular about how I like them. My avocado toast needs a touch of garlic. The yolks in my baked eggs needs to be the right amount of runny. And finally quiche- the pie shell must be flakey and butter and definitely no soggy bottoms! It needs to have a decent amount of cheese and a whole lot of vegetables. 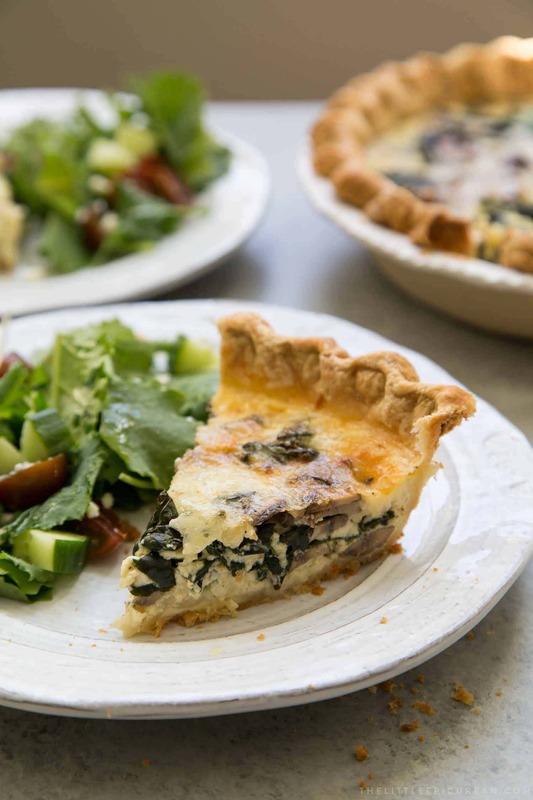 This is the very first quiche recipe I’m ever sharing. It happens to be my favorite to make at home during the weekends. 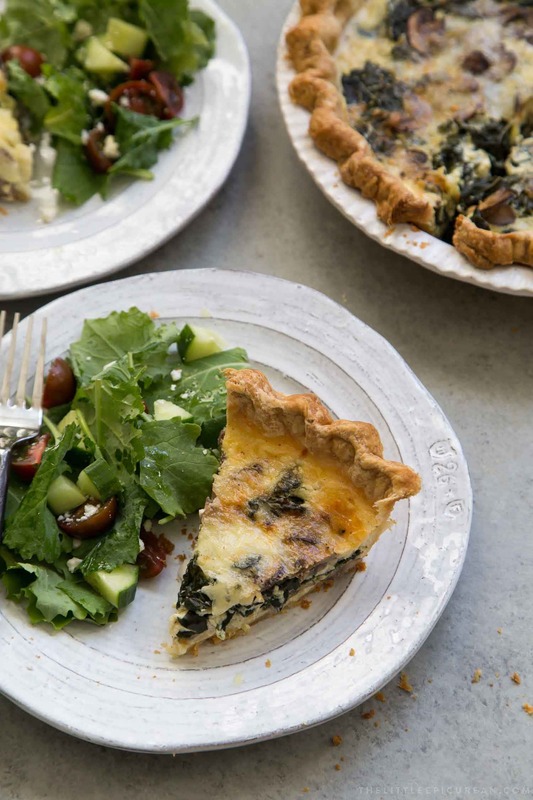 This mushroom kale quiche can be made ahead of time and stored in the fridge. I like to make it on Friday afternoon, keep it stored in the fridge, and simply reheat slices in the toaster oven for brunch all weekend. What is the secret to pie dough that doesn’t shrink while baking? I used a variation of my go-to pie dough recipe. It is similar to the one used in this persimmon cranberry pie and apple slab pie. The secret is vinegar! Distilled white vinegar prevents gluten development in the pie dough. Gluten forms when water and flour are mixed together. Gluten gives dough strength and elasticity. By inhibiting gluten development, the pie dough is easier to roll out. It won’t have much stretch and it won’t shrink during baking! Worried about the sour vinegar smell? You’ll definitely smell it when the pie dough is raw, but you won’t be able to taste it after baking. Feel free to substitute apple cider vinegar in place of the distilled white vinegar. I use them interchangeably when making pie dough. What is blind baking? It is necessary for quiche making? Bling baking sounds scary, but it’s not. Blind baking is simply pre-baking the pie dough crust before adding filling. 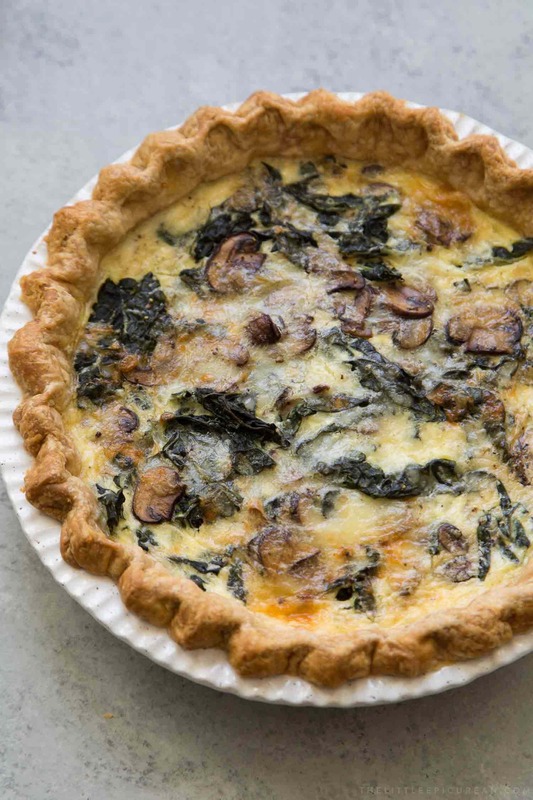 It is not required for quiche baking, but it will ensure that the bottom crust of the quiche is browned and crisp. 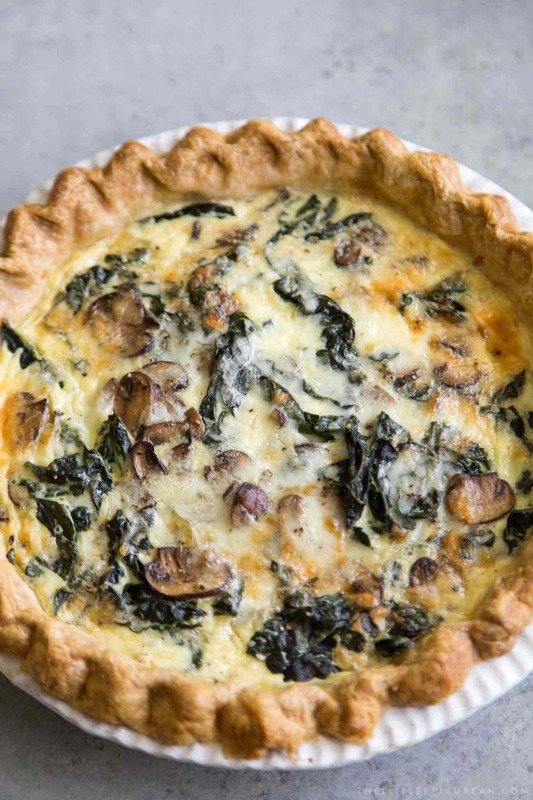 For this mushroom kale quiche, we will be partially blind baking the crust. Chilled pie dough is rolled out and placed inside a 9-inch pie dish. Flute, crimp, or decorate the edges of the pie as desired. Cover with plastic wrap and let the pie chill in the fridge until cold. Preheat the oven to 375 degrees F. Line the chilled pie crust with crinkled up parchment paper (this helps the paper mold more easily to the shape of the pie). You can also use aluminum foil or place a second pie tin on top. Fill with dried beans, dried rice, or fancy pie weights. Bake for about 10 minutes until the edges of the crust starts to color. Remove the pie weights and bake for another 8-10 minutes until the bottom of the pie starts to color. No need to wait for the pie crust to cool. You can immediately fill it with quiche ingredients. I like to sprinkle a layer of cheese on the bottom. Follow with the pre-cooked veggies and then top with any remaining cheese. Slowly pour in the whisked egg, milk, and cream mixture. And then bake! See that fork full of quiche photographed above? See that browned bottom pie dough? To me, that’s the sign of a great baked pie shell! It’s not soft and soggy on the bottom. Partially blind baking the pie dough before adding the filling helps to ensure that the pie dough is cooked well throughout. It ensures that you’ll get that nice crisp and flakey pie dough with each bite! In a large bowl, toss together flour, salt, sugar, and cubed butter. Cover with plastic wrap and let chill in the freezer until ingredients are cold (about 5-8 minutes). Dump dough onto a lightly floured work surface and gently knead until mixture comes together. Pat dough to a thickness of about 1/2-inch. Cover in plastic wrap and let chill in the fridge for at least one hour (overnight is best). Allow chilled pie dough to sit at room temperature for 5 minutes. Working on a lightly floured surface, roll dough into a 12-inch circle, about 1/8-inch thick. Transfer dough to pie dish and firmly press into the bottom and sides of pie dish. Trim excess dough. Flute, crimp, or decorate pie edges as desired. Cover with plastic wrap and allow pie dough to chill in the fridge until cold, about 15-30 minutes. Meanwhile, prepare filling. Preheat oven to 375 degrees F. Line pie with crinkled parchment paper and fill with dried beans or pie weights. Bake for 10 minutes. Remove pie weights and bake for another 10 minutes. Kale: In a large skillet, heat 1 teaspoon oil over medium heat. Add kale and toss to coat in oil. Add about a tablespoon of water. Cover and cook for about 3-5 minutes until kale has wilted. Remove cover and continue to cook until liquids have evaporated. Season with salt and pepper and transfer to clean bowl. Mushrooms: Add another teaspoon of oil to skillet. Add mushrooms and saute for 5-7 minutes. Mushrooms will expel a lot of moisture. Continue to cook until mushrooms are tender and most of the moisture has been cooked off. Season with salt and pepper and transfer to boil with cooked kale. Sprinkle half of shredded cheese on bottom of partially baked pie shell. Follow with cooked kale and mushroom. Distribute remaining shredded cheese on top. In a large bowl, whisk together eggs, milk, and cream. Season with a pinch of salt and pepper. Slowly pour liquid mixture into topping filled pie shell. 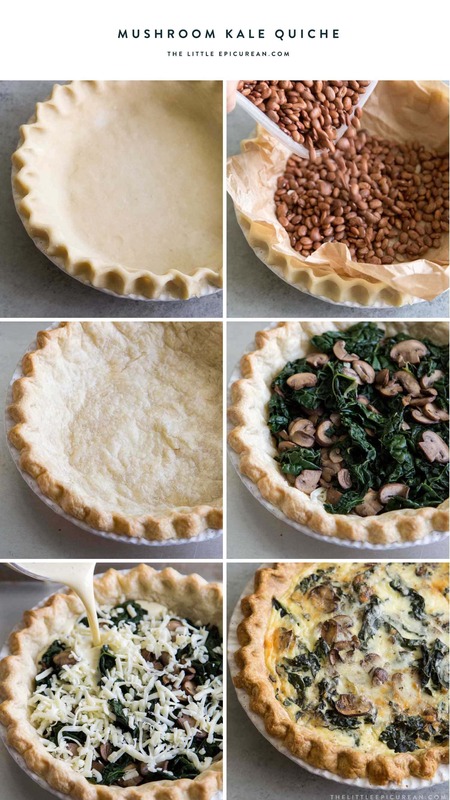 Bake for 35-40 minutes until edges of the pie are golden brown and the center of quiche no longer jiggles. If edges of pie are browning too fast, cover with foil, and continue to bake until egg mixture is set. Allow quiche to cool on wire rack. Serve warm or at room temperature. Keep any leftovers chilled in the refrigerator. Reheat in a toaster oven, bring to room temperature, or serve leftover chilled. This looks delicious. I can’t wait to make it when we get back from our trip!